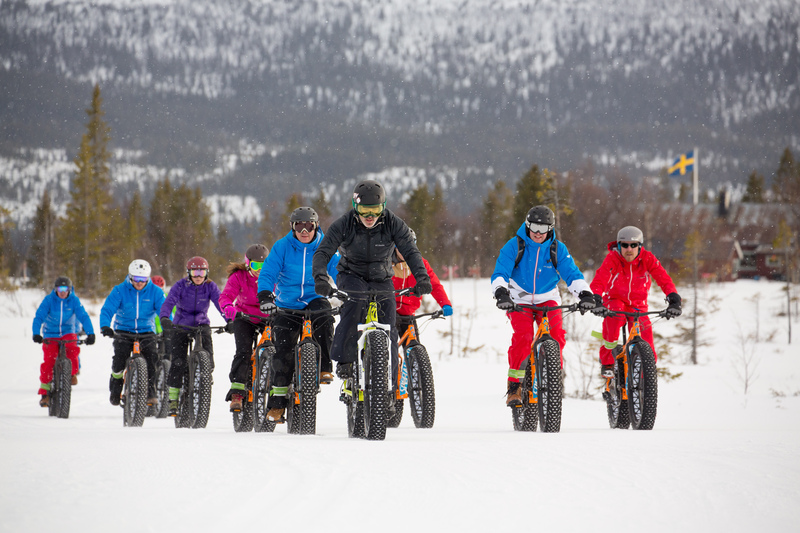 During our trip to Sweden with Columbia Sportswear and Jämtland Härjedalen Turism, we had the chance to sample three different ski areas, exploring both on and off-piste, in addition to dabbling in a variety of other winter sports–skating, moonlit snowshoe tours, Nordic skiing, and fat biking to name a few. Lagom is the Swedish word for “just the right amount” and sums up the country perfectly. Whereas english words like “sufficient” and “average” suggest some degree of abstinence, scarcity, or failure, lagom carries the connotation of appropriateness, consensus, and equality. You will find no bravado among the Swedes–they may be some of the raddest athletes in the world, but are more than happy to share a day with you on the slopes, a meal, or simply a coffee. The same word can be used to describe the ski resort atmosphere. Apart from the occasional crazy 80s cover-band-fueled After Ski party, you will find no Heavenly Angel dancers or fur clad celebrities toting ski valets here. Just a relaxed day out for everyone, beginner and expert alike. 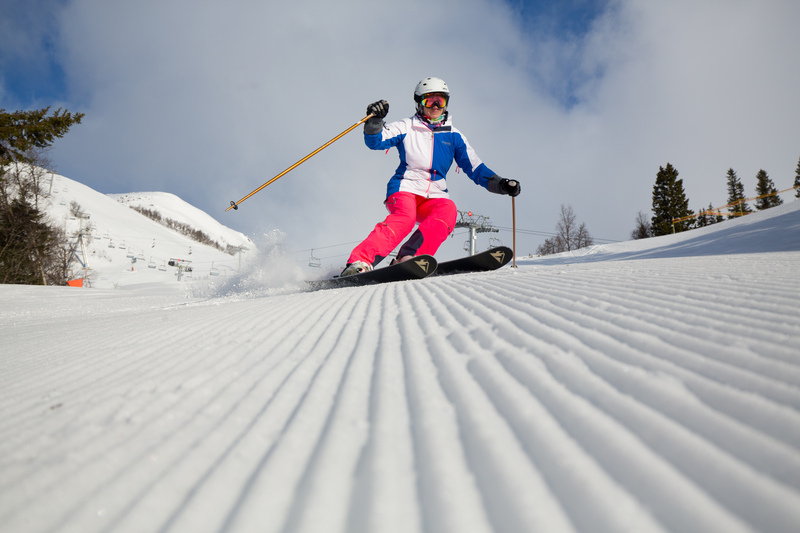 Apart from Sportlovet (winter sport’s holiday), Christmas, and Easter, the ski resorts remain blissfully uncrowded. Add to that world class gastronomy, affordable lift tickets (less than $40/day), and plenty of nightlife, and you will be left with no reason to pine for the Alps. The Jämtland Härjedalen region is easy to access–less than an hour’s flight from Stockholm you find yourself in Östersund, the gateway to Sweden’s Alps. 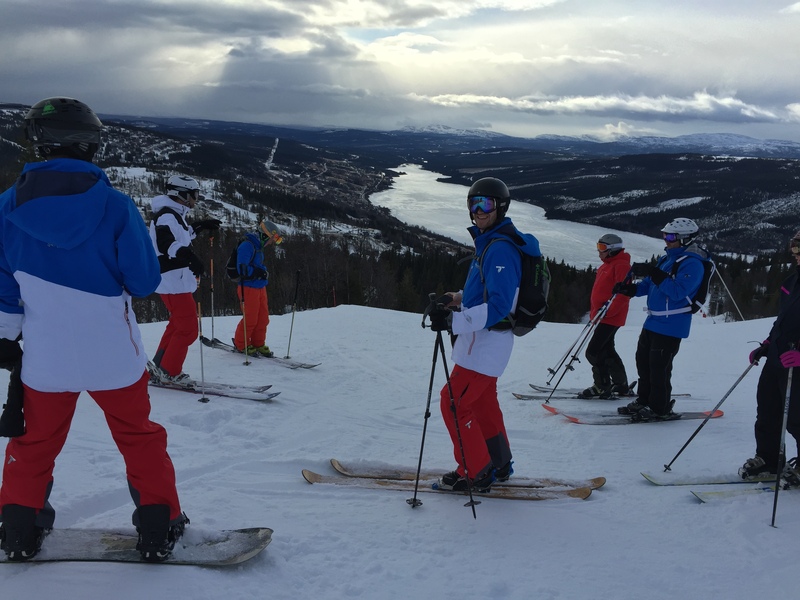 Åre, located around 60 miles west of Östersund, reigns as Northern Europe´s largest and most diverse alpine resort for all skill levels. A small picturesque village on the banks of the lake Åresjön, the town of Åre itself serves as the heart of Scandinavia’s most cosmopolitan skiing destination with shopping, a variety of hotels ranging from the large to the boutique, restaurants, and the best nightlife scene (don’t miss out on Bygget nightclub). The mountains are just a short walk and gondola ride away. From the top of 1420 meter Mt. Åreskutan, where visibility can quickly drop close to zero, you have access to over 100 runs of pristine “Manchester” (what the Swedish call corduroy) runs, the longest of which is 6.5 km long, across three different resort areas served by 42 lifts. SkiStar operates a large chunk of the country’s resorts, including lifts, ski rentals, and ski schools/guiding services, a bit similar to Vail here in the US. Your RF loaded ski pass records your daily ride statistics to view on the website or app and share with friends. 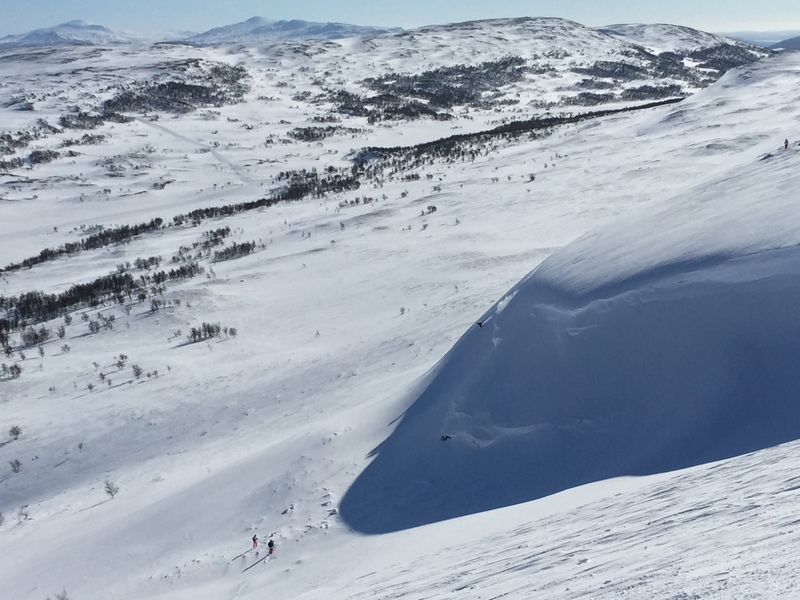 Further south in the region, Vemdalen may be one of the smaller ski resorts in Sweden, but is nothing to sneeze at, as snow is virtually guaranteed and the slopes are one of the first to open for the season. Consisting of three different areas, Björnrike, Klövsjö/Storhogna, and Vemdalsskalet, covering both sides of the valley, Vemdalen serves as a great ski vacation locale for families. One of my favorite places to ski was Funäsfjällen–with as many as five ski areas, hundreds of kilometers of off-piste terrain, including heli-accessed powder stashes, and 300 km of groomed Nordic ski trails, you can never get bored. 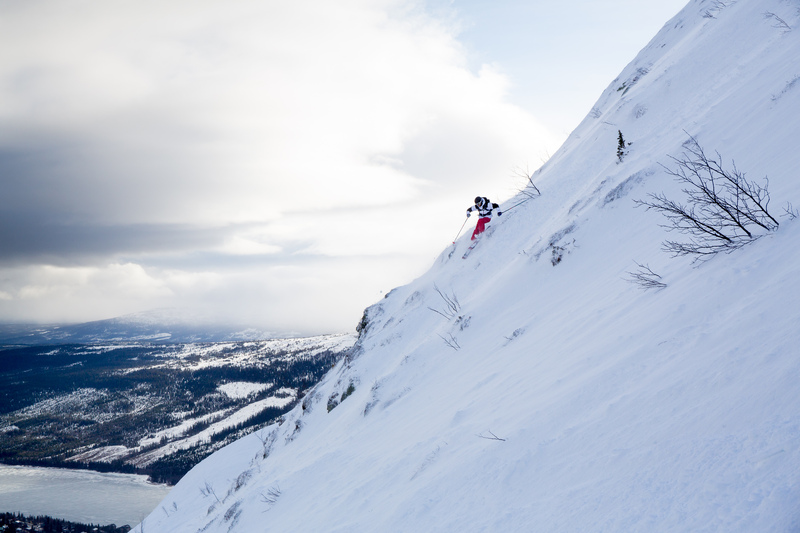 It’s incredibly easy to ski off-piste in Funäsfjällen. Easier, actually, than in most other ski resorts in Sweden. This is partly due to the amount of snow that falls here but also because the region allowed for off-piste at an early stage when developing new ski areas–as goes with tradition, everyone was involved in the decision making process for the good of the region. For example, even though heli-skiing and even snowmobiling bring in a ton of money, certain powder-filled areas are completely off limits as they house the threatened white or arctic fox. The Swedes have come up with some innovative ways to earn your turns. Our local guides from Sport Maffian, Hanna Rooth and Mattias Åberg, met us at the top of the Ramundberget lift each morning to tow us, at full speed, behind snowmobiles up into the high alpine areas of Ösjödalen. We had our pick of untouched lines on wide open bowls accessed by 450 km of marked touring trails, with views across to Mt. Helags–at 1796 meters, the highest peak in Sweden south of the Arctic Circle. Once you had your fill of the freshies, be sure to stop for a fika of coffee, waffles and lingonberries at the Ösjöstugan backcountry hut before heading back down the resort to enjoy some After Ski or a Swedish sauna and polar plunge–nothing could be more lagom than that. We made the trip to Sweden to test out Columbia’s new Fall ‘15 line of apparel. Built off the medal winning Olympic uniforms, the Titanium collection offers the best in class for ski apparel. Shreddin Jacket: My favorite jacket to ski in, the lightly insulated Shreddin features an Omni-Heat Reflective liner for added warmth–you only need a baselayer beneath this piece on all but the coldest of days. Pit zips come in handy for the occasional bootpack and an integrated powder skirt secures on to loops on the Jump Off ski pants for those deep pow sessions. 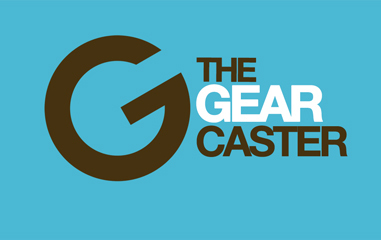 An internal goggle pocket with envelope closure ensures you won’t lose your extra lens or sunglasses, while a zippered phone pocket features both a media port and mesh lining through which you can still use your touchscreen. The jacket sits low over your bum to keep your backside warm. My only beef is the zippered hand warmer pockets sit low as well, meaning if you have something larger like your phone or notepad stuffed inside, it regularly gets caught when you bend your legs. Apart from that, add a helmet compatible hood, pass pocket, adjustable thumbhole cuffs, a two-way front zipper, and you couldn’t ask for a better ski jacket. Jump Off Pant: These lightly insulated ski pants also use an Omni-Heat Reflective lining, with “junk vents” for the men and side vents for the ladies to enable quick heat dumps. Zippered pockets at your knees make for easy access on the lift, while integrated gaiters and powder skirt loops work together to keep snow out of your pants and boots. For the Swedish ski conditions, most of us ditched the bottom baselayer. HeatZone 1000: For those really cold days on the mountain, the windproof, waterproof HeatZone should be your go-to jacket. Warm yet breathable, I have worn this jacket for everything from winter hiking in Zion to ice climbing and skiing in sub-zero conditions. The jacket uses Columbia’s new TurboDown Wave insulation in the core, with a lighter zoned insulation in the arms and shoulders. Other features include a helmet compatible hood, pass pocket, and internal gloves/goggle pockets. Though more of a lifestyle piece but still useful outdoors or for yoga–the Reflection Hoodie should be on every woman’s radar next fall. I lived in this super comfortable hoody during our trip to Sweden and have not taken it off since.